I predicted DeWalt would be announcing their 20 Volt line of tools in June, and here we are, I was right, and I am still not a fan of calling 18V tools 20V Max, but this is a battle I cannot win. I always say that if you are going to buy a cordless tool, you are really buying into the whole manufacturers cordless system. Once you own one tool from a manufacturer you are more likely to stick with the same battery and charger, so you buy other tools. So when a manufacturers comes out with a new line of tools, it is always best to come out with a whole lot of tools for the same system. 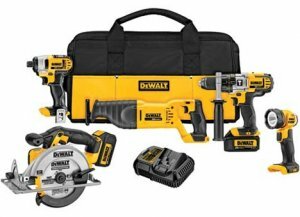 Thankfully for us, DeWalt is on the same page; their new line of 20V Max tools launched with a total of 11 new tools, which includes a compact drill/driver (DCD780C2), premium drill/driver (DCD980L2), two impact drivers (DCF885C2 and DCF885L2), compact hammer drill (DCD785C2), premium hammer drill (DCD985L2), reciprocating saw (DCS380L1), circular saw (DCS391L1), SDS rotary hammer (DCH213L2), right angle drill (DCD740C1) and work light (DCL040). The new 20V Max line uses a slide style battery that is similar to the other 18V lithium-ion batteries on the market today, and similar to the DeWalt 12 Max batteries. In fact, the new charger for the 20V Max batteries can also charge the 12V Max batteries; this is a huge advantage that DeWalt has versus their competition. The 20VM tools can use either a compact 1.5Ah battery or the the regular 3.0Ah battery, and kits will be sold that offer both. The tools in the 20VM system have been designed from the ground up and offer the same ergonomic features that DeWalt implemented in their 12VM line. The most notable changes are to the grip area and weight distribution. The 20VM system also has some great electronic features that helps to maintain consistent power throughout tool use, maximize battery life, and prevent overheating. There is so much information on all of these new tools, that I have not even had a chance to go through it all. So in an effort to speed thigs up, I have posted the press releases for on the next pages. Happy reading.